Jimmie G. Haynes of LaGrange, Ky. husband of the late Shirley Haynes, died Saturday, May 26, 2018 at Friendship Health & Rehab in Pewee Valley. He was born in Horse Branch, Ky. November 4, 1935 the son of the late Taylor M. & Minnie Haynes. Jimmie retired from Ford Manufacturing after 34 years and also worked at Tri County Ford. He loved fishing and UK Basketball. 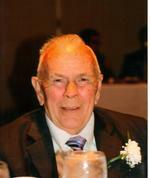 Jimmie was a loving husband, father, grandfather and great grandfather. Besides his wife of 60 years and his parents he was preceded in death by sisters, Irma Willoughby and Esther Byers. Special thanks go to Family Tree Care Services for providing caregivers Billy Durham, Mary Alverson, and other caregivers Charie Norris and Sarah Ellis. Also Friendship Health & Rehab for their special care. A service celebrating Jimmie's life will be held 2:00pm Saturday, June 2, 2018 at Louisville Memorial Gardens Funeral Home East, 11601 Ballardsville Rd. Visitation will be Friday at the funeral home from 4 to 8.